Is Sortd really the best Gmail app? It’s quite easy to get lost among so many software options when it comes to Gmail. Nowadays, there are so many different paths you can choose and sometimes instead of making life easier, it just gets more difficult, so you’ve got to make sure you’re making the right decision. Sortd is a good app, but we strongly believe there are several gaps that must be considered before you choose it. It’s stability can be improved. Besides other issues, one thing you should take in account is how a software like this changes email. The more a plugin is integrated with the tools you are familiar with, such as Gmail, the faster will be your learning curve and lower will be the barrier to adopt a new email tool. Sortd completely rebrads your whole Gmail experience, which demands a lot of time and energy to make you get used to a new interface. There are several incredible other options that provide you the same Gmail Experience, so you and your team don’t need to learn about how to do something from scratch — or even how to adapt to some malfunction. You know, if it doesn’t do simple tasks, you’ll be obligated to switch between software and email all day (which is the complete opposite to the reason why softwares like this exist). One of the first aspects that comes to users’ minds when they’re looking for an alternative to boost their email is how they can make it more collaborative to their team. Tools such as Shared Inboxes are quite useful to that, because they simplify teams’ lives. Unfortunately this is a tool Sortd doesn’t provide. It feels collaborative because users can “share boards” with each other. But when you think about replying to emails on behalf of each other or receiving emails from shared inboxes such as help@ in real time, Sortd simply doesn’t allow it. So if this is essential for you, you’re better out with other alternatives. When a company suggests a software to improve users’ experience in something they already use a lot, it’s expected of them to start from what already exists and grow from that. Unfortunately, Sortd left some important aspects behind, with some technical challenges ahead. For instance, if you’re trying to read a email thread with many replies, you might be able to only see the original message. Some users with rules applied to their Gmails have also complained that some of them just stop working with Sortd. Review for Sortd on their Google Chrome Store. One of the many complains users have on Sortd is the stability on the software. We found it very common for users to have issues with information disappearing, or being suddenly unavailable. Besides that, their support system for users has enormous gaps to fill, so if you’re trying out Sortd, be careful not to add everything before testing for a while. So, what else is on the market? By seeing flaws like these, you might be wondering about more mature softwares. On the other hand, it’s also important to keep in mind that simplicity — specially for smaller companies — is an extremely crucial element, so depending on your team, it is something you don’t want to get rid of. We allow your team to learn faster and have less questions about what’s new. We also centralize work, because we have helpdesk boards inside your email. Basically we change everything, but we keep it visually the same. We make your business life much simpler. Our software is the only one that doesn’t add any new logins/websites for your team. It works straight from your Gmail Inbox. We believe that simple solutions make everything better for both sides because they decrease the amount of new information you need to learn something new. 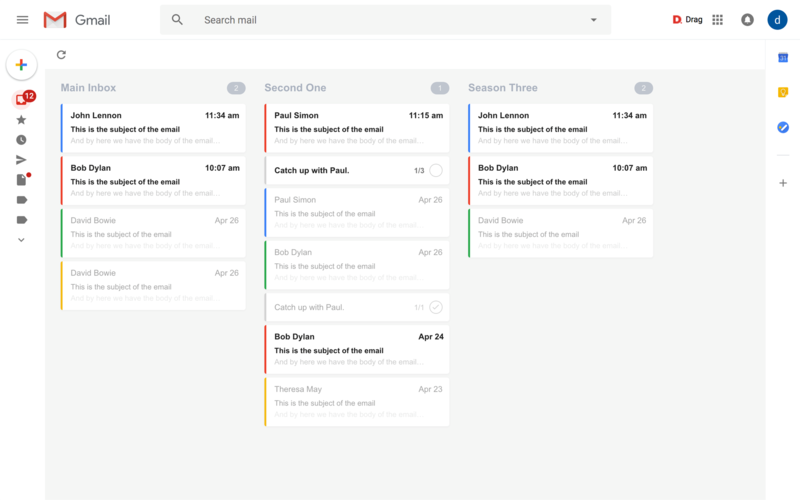 Besides that, Drag brings Kanban view into your email. This makes your work completely different – although it stays in the same similar place you already know. Drag starts for free, but if you want to unlock its full power, it’s just $12/month/user. Although everything we just presented, you might still think Sortd is the best option for you and your company. If this is the case, go for it! However, is Sortd a software you should have a look before choosing a final option? Definitely. But is it your best choice? We believe that a Sortd alternative — the right one for you — have already thought about all of these simple aspects and solved them. No software is flawless, but choose one that delivers at least the basic items you need for your overall experience on their platform. Also, it is crucial to understand your needs and how much resources (time, people and money) you have available to invest on it.